The boy does look Native American as does the blanket, so that works for me. I won't comment on what is a box of CJ doing on Indian Grounds? OK, so some of the prizes have the Indian chief, Indian maiden, and teepee. A mother kangaroo and her joey! HAPPY MOTHER'S DAY to all the loving mothers out there! Awww, how sweet, Alex. That lucky mom has a built in carriage for her baby. The next two old photos that I work on and upload will be for Diane & Larry on this topic. And even rich and famous moms give their babies Cracker Jack. Little Shiloh is snacking on FRITO-LAY chips but if you look to the lower right of the picture, you will see Mommy Angelina has a bag of CJ in waiting. The caption in the lower right hand corner indicates this photo was taken in New Orleans. So how about it jdnola, did you take this picture or at least maybe see it happen? Many of you will remember this photo appeared in the January 14, 2008 issue of US WEEKLY magazine. Thanks for sharing this touching mother, child healthy foods moment! Mother's Day is almost here! 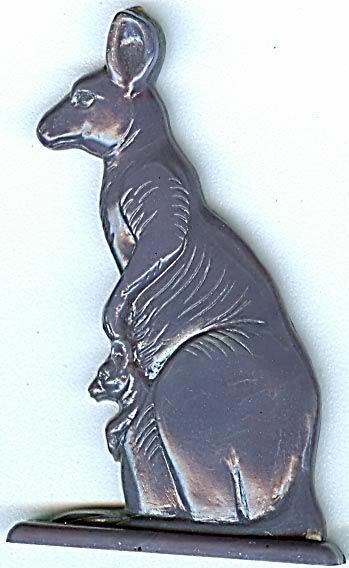 This zoo sticker from the 1980's shows a cute little baby who wants to stay very close to his gorgeous mom. Here is a mother owl lovingly taking care of her two owlets! 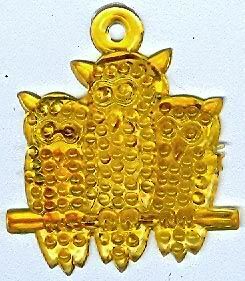 It is a Cracker Jack transparent Amber Plastic Dangle prize from the 1950s.